The universe is a far stranger place than most of us know. From giant diamond stars to exoplanets coated in hot ice, every day, the list grows longer. Sometimes, these oddities can be explained within the confines of science, but not always. 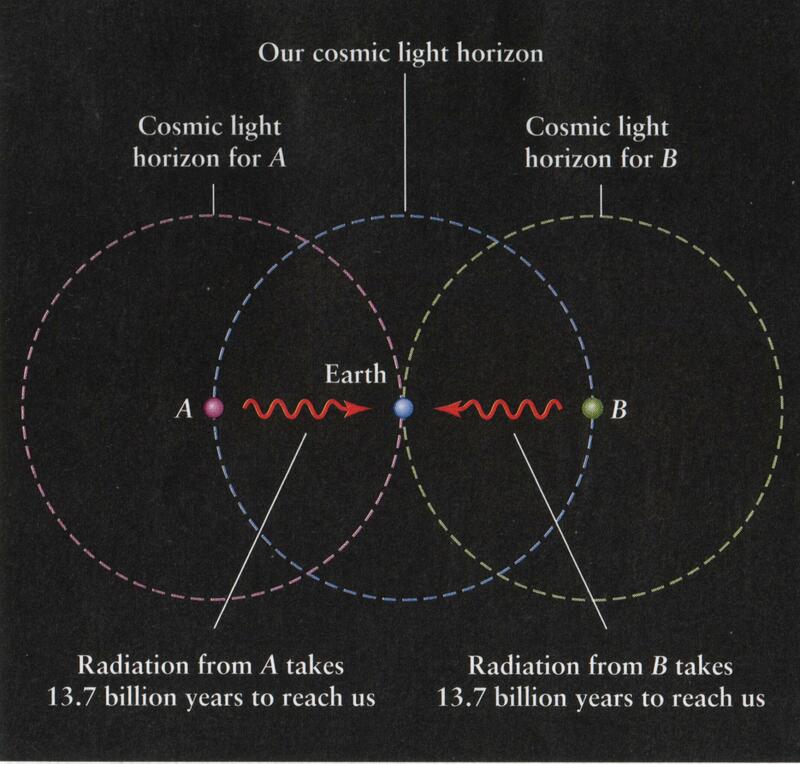 The universe is essentially divided into two parts: first, there is the ‘observable’ universe, which has a diameter of approximately 93 billion light-years (13.7 billion light-years in every direction), and then we have the actual universe, which has no set diameter. One could argue that, based on its flat geometry, it continues infinitely in all directions, but we can only see a comparably small cone: defined as the region in which enough time has elapsed for light from the most distant sources to reach Earth. We know that something exists beyond our cosmic horizon, we are just unable to see just what. However, just because something leaves no discernible trace to the human eye, that isn’t to say its presence can not be inferred. For instance, take black holes—these infinitely dense objects emit no light whatsoever (hence the black part of ‘black hole’), yet we can identify them by looking at the manner in which they interact with their surroundings (the same can be said of dark matter: the elusive substance that makes up a large portion of the universe’s mass). Gravity is one of the most useful tools we have for studying that which can not be seen traditionally; it has applications in everything from finding exoplanets, to deciphering what happens at the edge of a black hole. And since its effects are the same on large and small scales, it can also be used to explore the most distant reaches of space. This brings us to a little something called dark flow. Over the course of three years, NASA’s Wilkinson Microwave Anisotropy Probe (WMAP) was tasked with two things; studying the cosmic microwave background radiation—the afterglow of the big bang, which came into existence when the universe was 380,000 years old (when the recombination era commenced)—and cataloging deep space clusters. 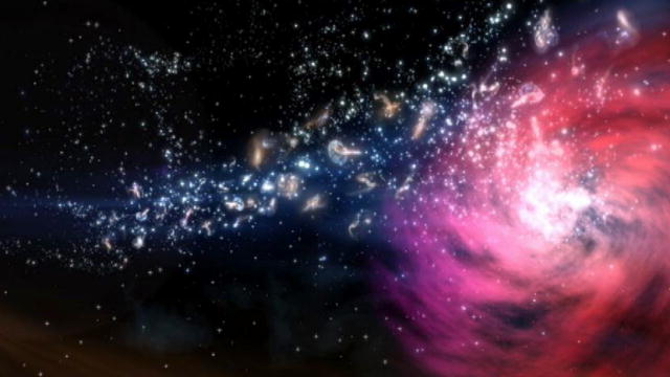 When its mission was complete, they found evidence of more than one hundred galaxy clusters, all set alight by superheated, x-ray emitting gases. 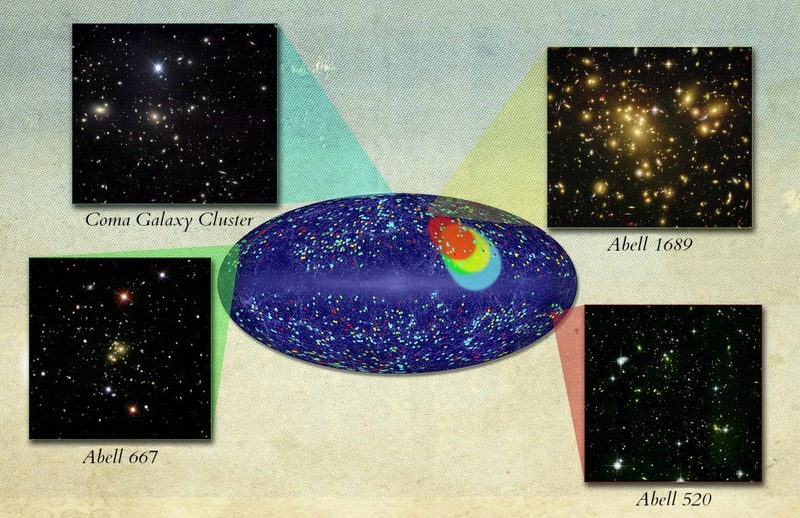 An anomaly was realized when the researchers compared the CMB data with that collected of the clusters. Our theories on the CMB basically say that the microwaves should be uniform (in other words, it should look the same no matter the direction), and that they should pass through galaxy clusters predictably (with predictable changes in temperature)—based on whether the galaxy is moving relative to the background glow. Instead of learning that the clusters and the CMB behave as expected, they found something rather strange. The clusters—some situated more than 3 billion light-years away from Earth—were found to be traveling more than 2 million miles (3,218,688 km) per hour into a 20-degree expanse of sky, forming a line from our solar system to the constellations of Centaurus and Hydra. Furthermore, the trend is not a statistical fluke; rather than the clusters buckling back to normal speeds and distributions, the trend continues to hold steady throughout intergalactic space. Image Credit: NASA/Goddard/A. Kashlinsky, et al. “It’s the same flow at a distance of a hundred million light-years as it is at 2.5 billion light-years and it points in the same direction and the same amplitude. It looks like the entire matter of the universe is moving from one direction to the next,” says Alexander Kashlinsky, a researcher from NASA’s Goddard Space Flight Center in Greenbelt, Maryland. This baffling phenomenon, now called dark flow, has resulted in numerous hypotheses, but most circle back to the very first moments after the universe came to exist. Astronomers suggest that something happened merely a fraction of a second after the big bang—before inflation even, the brief period of time when the universe began to expand outward at incredible speeds—is involved; whatever it may be lurks just beyond the scope of our observable universe, Just what, however, remains the million dollar question. “We can only say with certainty that somewhere very far away the world is very different from what we see locally. Whether it is another universe, or a different fabric of space-time we don’t know,” Kashlinsky continued. Of those two options, the former makes the most sense. In fact, a variation of one model—based on string theory—fits the bill quite nicely. It says that our universe wasn’t the only one to arise after the big bang, but that it may have a sister (or twin universe (an idea that has some observational evidence supporting it), which may be exerting a gravitational pull on the clusters (explaining their speed). Regardless, nothing in the observable universe has enough firepower (or mass) to pull something like this off on a large-scale. 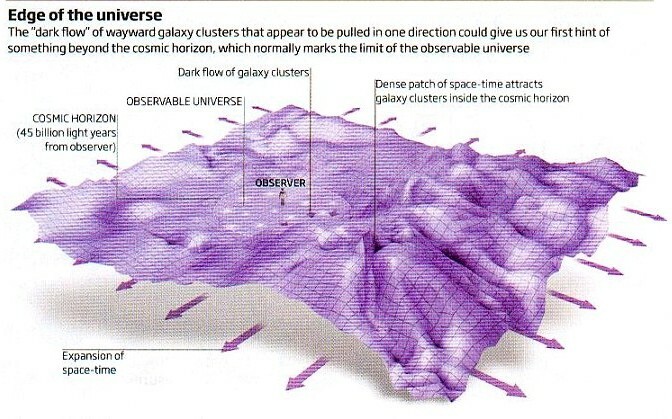 However, it has been suggested that we can explain dark flow without having to add other universes into the equation. Perhaps the way we view the inflationary period is off: when the universe originally started to balloon in size, one section (the one far outside of our periphery) grew more rapidly than the other (our local universe). Then, of course, perhaps this is just another thing that ties back in with dark energy—the force driving the accelerated expansion of the universe, It’s hard to say, but it does present some interesting questions.